I recently suffered a UDP flood attack on my little virtual private server (VPS), and thought I'd describe the steps I went through to discover and fix the problem. And this was after I had rate limited eth0 to 2mbits/sec using tc (more on tc in a bit). 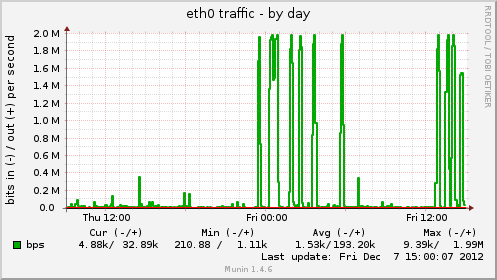 CPU usage and interrupts for eth0 also spiked. So something was flooding eth0, and stalling the server. echo -ne "\r$pkt outbound packets/s\033[0K"
echo -e "\n`date` Peak rate exceeded, dumping packets." echo "`date` Packets dumped, sleeping now." This will search all files that have fsockopen followed by any character, for any number of times on the same line as udp. The search is case insensitive, and recursive. Sure enough, there was a little nastygram of a PHP script sitting in the theme directory for a site I'd been experimenting with a few months ago. The theme had a well publicized bug in it that allowed an attacker to upload an executable script to the server. The script could then be called from a regular Web request, passing in the target server and duration for the UDP flood attack. I removed the script, patched the theme, and turned off the experimental site (since I was no longer using it). I also did a little more reading on how to guard against UDP flooding, as well as SYN floods, and updated my iptables settings accordingly. Below is my iptables baseline script. I don't believe this is a comprehensive iptables script for securing a Linux server - but it's a start, and the UDP flood protection seemed to be working after a few tests. 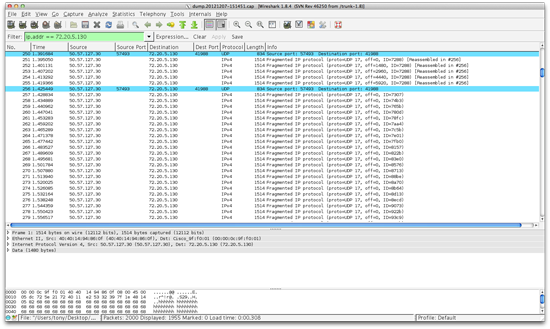 echo "Flushing iptables and allowing everything..."
echo "Applying iptables baseline rules..."
# Allow connections that are already connected to the server. # Outbound UDP Flood protection in a user defined chain. # If we made it this far the packet will be dropped - so log it as denied. And lastly - I left my tcpdump peak packet rate script installed and running, so that if anything unusual happens on the server, I'll have a chance to look at it and decide if it's a normal event, or something else. A few things: Firstly - traffic control and traffic shaping with tc is very cool. Here's a great introduction and howto article on tc. If you're hosting a VPS on a fat pipe at one of the better hosting services, you need to keep tc and queuing disciplines up your sleeve - since a big increase in bandwith usage will probably cost you $$$. Secondly - iptables are also very cool and the first mandatory step in securing your hosted Linux box. Thirdly - tools like grep, find, ps, netstat, lsof etc. are all part of a sysadmin's toolbox. I'm not claiming Fu-like sysadmin status by any means, but it's amazing what you can accomplish with the long list of small sharp tools that are part of the free GNU user space application collection, and free with every GNU/Linux installation. Fourthly - Linux is fun. That is all. Thanks so much. Hope you share more. Thank you Anthony for this concise and very helpful post. After doing the search grep -ir 'fsockopen. *udp' /home/ found /licence.php files in public_html ...a quick easy fix. Thanks again.